It is 1831 and Barnaby Skye, a deserter from the British Royal Navy and now a seasoned trapper in the Rocky Mountains, accompanies his Crow wife, Mary Quill Woman--whom he calls "Victoria"--to her village on the Yellowstone River. Victoria--unhappy with her husband's drinking and his unwillingness to join her people's fight against their sworn enemies, the Blackfeeet--succumbs to the entreaties of Jim Beckwourth, the much-honored and wealthy mulatto war chief of the Crow People. But when Victoria is abducted by the Bloods, the deadliest band of Blackfeet, Skye trails her across the border into Canada, where he is still wanted for deserting his ship at Fort Vancouver four years ago. But the Bloods are a deadly force, and Skye must face his fiercest battle ever to win her freedom and her heart. At the Publisher's request, this title is being sold without Digital Rights Management Software (DRM) applied. 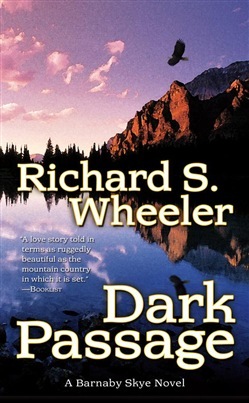 Acquista Dark Passage in Epub: dopo aver letto l’ebook Dark Passage di Richard S. Wheeler ti invitiamo a lasciarci una Recensione qui sotto: sarà utile agli utenti che non abbiano ancora letto questo libro e che vogliano avere delle opinioni altrui. L’opinione su di un libro è molto soggettiva e per questo leggere eventuali recensioni negative non ci dovrà frenare dall’acquisto, anzi dovrà spingerci ad acquistare il libro in fretta per poter dire la nostra ed eventualmente smentire quanto commentato da altri, contribuendo ad arricchire più possibile i commenti e dare sempre più spunti di confronto al pubblico online.